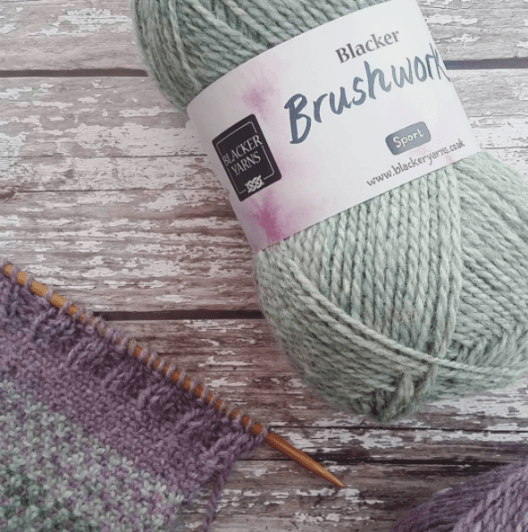 Today sees the launch of Blacker Yarns 12th birthday yarn – Brushwork! This is a sport weight yarn, which combines a delicious wool and fibre content with an artistic inspiration. The wool contains Bowmont, Castilemilk moorit and alpaca! “Scottish Bowmont are very special sheep, their fibre is renowned for its superb fine quality. 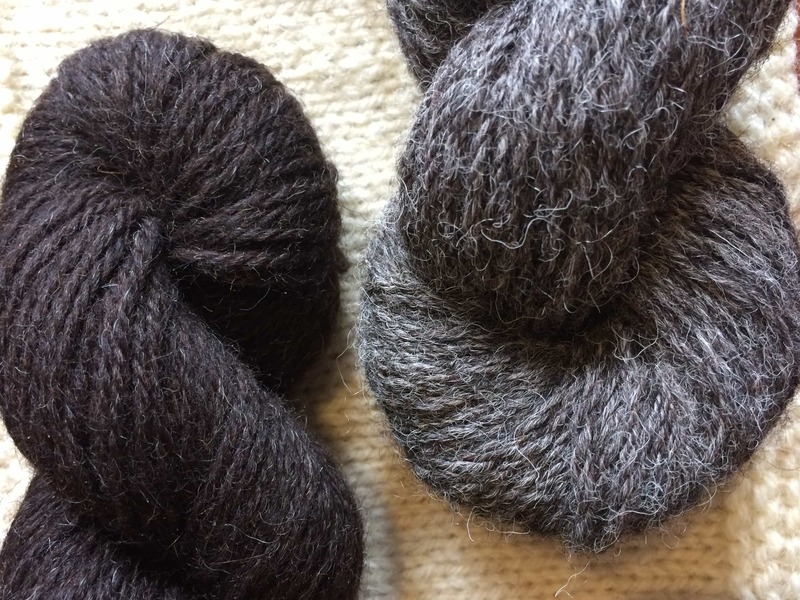 They were originally developed by crossing Saxon Merino with Shetland, to make a Merino-style sheep which could live comfortably in the UK’s damp climate. The colours of Brushwork compliment that special blend so much, Eight shades – all named after painting techniques and processes – have been created by dyeing the fibre in the wool and the shades have been blended as little as possible to preserve those individual characteristics of little pops and neps. First impressions were of a really “sheepy” yarn. It had a lovely smell and felt soft and quite lofty. As I knitted it I became aware that it was quite oily presumably with the lanolin from the wool element of the blend. Not unpleasant, made my fingers soft, but quite apparent. It lent itself to the little bit of cabling I did with it but also produced a nice smooth stockinette. Described as a sport yarn, I would call it more of a DK. The colour palette was gorgeous. Beautifully muted, heather colours which toned wonderfully with each other. Eight colours with a group of blue/lilac/purple and grey/verdigris/green plus another 2 brighter colours to give a bit of pop to your colour work. I achieved the tension stated for 3.5mm needles which surprised me as I usually knit more loosely and need to go down a needle size. After washing and blocking, the finished fabric changed quite significantly. It had stretched quite a bit and was now 20sts to 10cm instead of the 23 I got initially. I would definitely go down at least one needle size if I wasn’t doing colour work as I feel any resulting garment would “grow” considerably. This might just be my loose knitting! The row count remained fairly constant. But the fabric had softened unbelievably and felt absolutely wonderful. It had bloomed and would just make the most wonderful comfortable garments. Due to time pressure I only wore it for a couple of hours against my skin but I knew before even doing it that it would be undetectable and so it proved. Only one negative, and I have found it with other Blacker yarns: The way they wind the ball and tuck the loose end in to the middle. I find it impossible to get the loose end out without also pulling a clump of tangled yarn out of the middle of the ball. Then you have to try and untangle it to find the end and then shove the clump back in to the middle again. A small point, and it wouldn’t, and hasn’t, stopped me buying their yarn. I can see myself buying the three grey/green colours of this and doing a cardigan with a colour work yoke which would be a staple, go-to item for the autumn/winter. This new birthday yarn from Blacker surprised me right from the first squish of the ball. I am used to (and love) the more rustic, hardwearing yarns from them and this felt very different. In the ball, it’s very soft, smooth, with a faint halo and the very tiniest white and black fibres peeping out – virtually unnoticeable. It immediately suggested a number of possibilities but the one that screamed out at me was colourwork. I knit quite a large swatch to test out textured lace, stockinette, garter stitch and some fair isle. 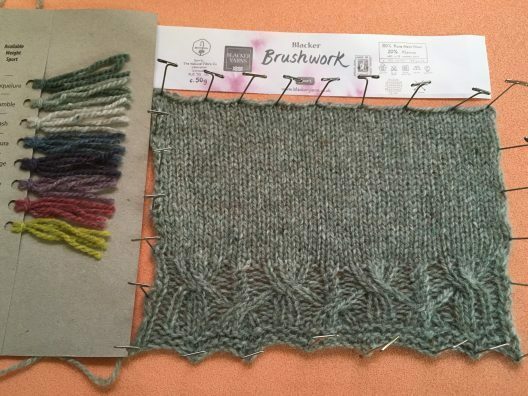 I only had one colour of the Brushwork, so the two other colours in my swatch are Kate Davies’ Buachaille yarn, which is also a sport weight. I often mix similar weight yarns when doing colourwork so this was another thing I wanted to test. Does it play well with others? Also, I think the Brushwork palette with its more muted tones provides some nice mix and match options with Buachaille’s more primary colours. Brushwork is very pleasing to knit with, no snags, no splitting. It reminded me of Rowan’s Felted Tweed in terms of the look and feel, particularly in stockinette, but I like this much better as it’s 100% natural fibres. 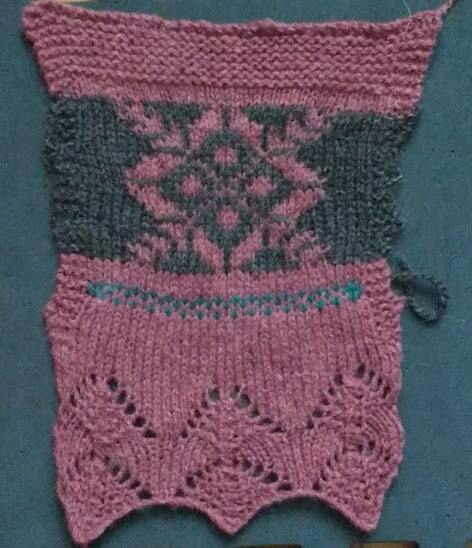 After blocking, it bloomed slightly and the fair isle stitches settled down and smoothed out as I had hoped. I would definitely recommend this yarn for colourwork. The lace blocked nicely, there’s good stitch definition and it’s gorgeous in stockinette. 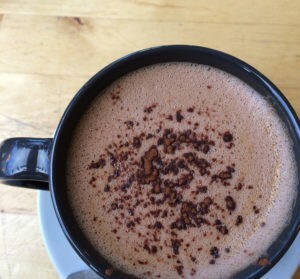 I gave it a good vigorous scouring for a few minutes, and while there was some initial agitation of the fibres, when I pressed my hand again over the swatch, they flattened down and there were no signs of pilling. This would be an especially lovely yarn to use for larger, cozy textured shawls – I’m thinking patterns by Karie Westermann or Sylvia McFadden – and for jumpers and cardigans. However, for those with more sensitive skin, I do need to state that there was a prickle factor. I wore my swatch for a few hours with the Brushwork only end tucked into my bra and could feel it the whole time. It wasn’t itchy or terribly uncomfortable but is noticeable, so I would wear something under it. Swatch: I swatched on the recommended 3.5mm needles and just kept adding panels of different stitches to see how it looked. It knits like a dream, soft in my hands but grippy enough not to ladder if you drop a stitch and sturdy enough to withstand several tink backs whilst I played around with stitch patterns. Although I only had one colour to play with I’d really like to do some simple colourwork with this yarn too – I am imagining a cosy fair isle yoked sweater in those gentle watercolour tones…After blocking: The fabric is dense yet drapey with phenomenal stitch definition . The lace panel in particular looks amazing – now I want to knit another Lush in this or maybe a Windswept sweater. I absolutely LOVED Brushwork. The colours are incredibly luscious, I’ve never seen colours like them in yarn. I received the craquelure and it is a really gorgeous not quite khaki shade with some really bright flecks of yellow-green throughout – I can absolutely tell why the yarn was called Brushwork, the shade with the flecks did remind me more of colours seen in paintings than yarn. 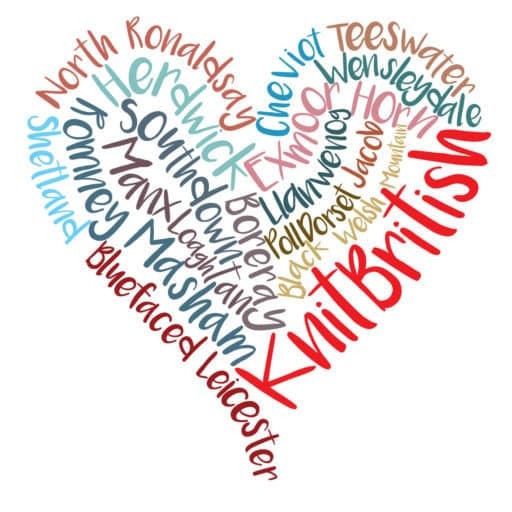 I’ve never knitted with bowmont or castlemilk moorit. And it is a gorgeous blend, it is soft with a bit of crunch to it when you receive the ball but the hand-squish-grab is really lovely to the touch. Knitting with it was excellent, although it’s a sport weight it felt it little more like knitting DK. 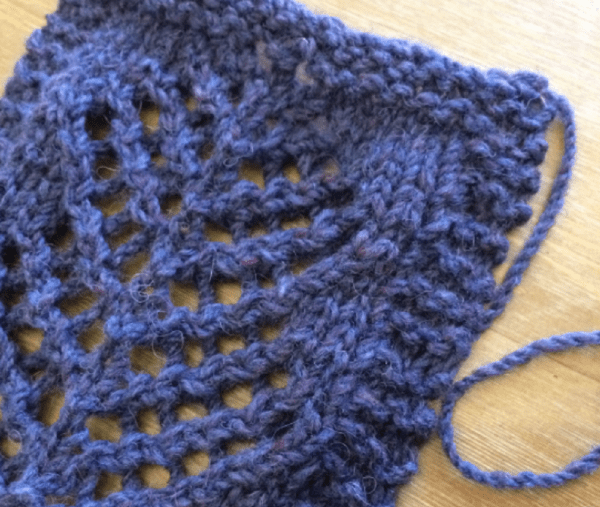 It is easy to knit with and garter stitch looks excellent and really pops with this yarn. I wore my garter stitch swatch beside my skin (tucked in a blouse in at my elbow and also tucked under my bra near my oxter) and I barely noticed it, despite the crispness felt in hand this only helped show the structure, but isn’t felt against the skin, either before or after blocking.It was great to receive the shade card the colours are amazing, I can’t wait to buy some of the other colours, especially splosh and scramble – I will definitely be buying more of the colours on release! I’m sure you are as grateful as I am for these mucker reviews – so well considered and in-depth! I particularly love how the different reviewers responded slightly differently to how the yarn and fabric feel. Thank you Susan, Maylin, Emma and Anthea! Blacker Yarns have been so very generous and have given us SIX balls, in the Velatura colour, to give way. This is so incredible and I’ve decided to split these into two prizes of three balls each. That is 456 metres and plenty for a shawl, cowl, mitts or a couple of hats. 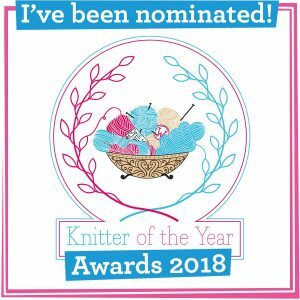 In order to enter the giveaway there is a thread in the Ravelry group. What to do and all the info you need is in the Ravelry group. Please do not enter below. Entry is via the ravelry thread only. If you don’t want to leave it to chance and you want to get your hands on some Brushwork get on over to Blacker now! Best suited to: ALL OF THE THINGS! 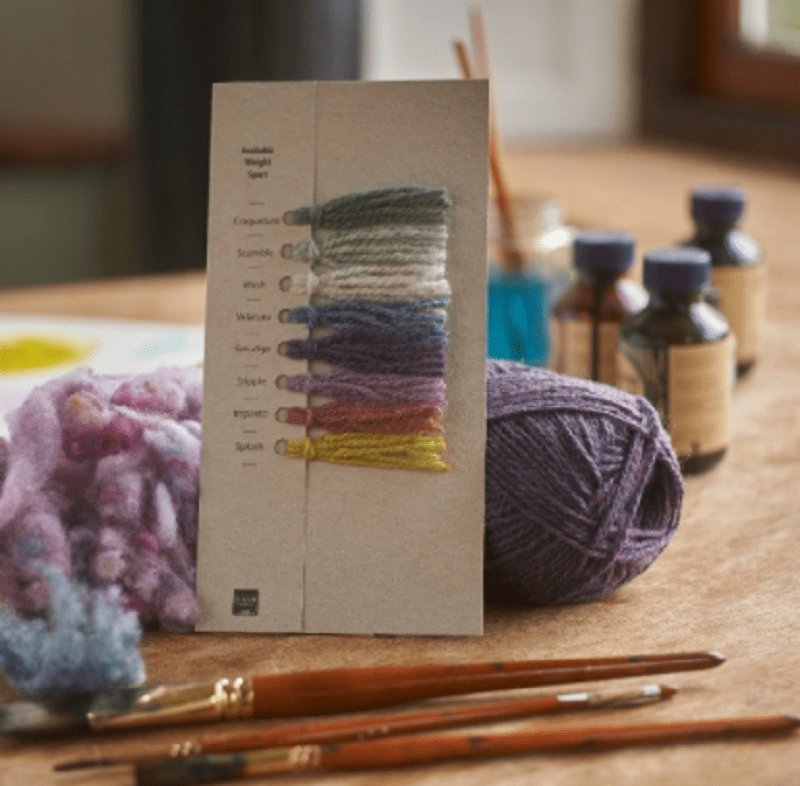 Get it fast – Brushwork is a limited edition yarn. Next PostEpisode 94 – Paved with Good Intentions!